Landscaping ideas play the most important role in making your home inviting and relaxing. Landscaping is the art of preparing your outdoor areas where the land, trees, plants, rocks, even water all happen together in unity. And when you turn your own ideas into reality, you've put your signature on your entire surroundings. The effects of well-done home landscape designs and ideas can be stunning... or inspire subtle appreciation. Landscaping improves yard and garden plans in both useful and artistic ways. While designing your landscape remember the needs of your family! Small children need a play area, complete with tree swings or a tree house. Older children may need areas for sports and hobbies. Adults might prefer a quiet hideaway, a vegetable or flower garden, or a patio for outdoor entertaining. You can creatively and powerfully transform your yard, without heavy equipment or exhausting work. The secret? Go about the changeover one small tree at a time. Or one rosebush at a time... or a few steppingstones at a time. Make your landscaping designs and ideas happen within your budget, and within your busy schedule! With home landscape designs and ideas, you should work with what you have, then decide what you want to add as "new". Draw attention to a pretty view. Keep your plantings low so the view can be well seen. 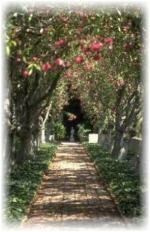 Garden paths or a simple water garden are wonderful ways to direct focus towards an area. garden trellis with beautiful climbing vines. Discover how to create landscape designs that will screen out any undesired scenes. Beautiful landscapes begin with a healthy, vibrant lawn. The hallmark of the most beautiful landscape designs are flourishing lawns flanked by flower gardens, trees, shrubs, and tasteful garden structures. But without the appearance of a cared-for, lovely lawn, all the planning you do will lack in overall beauty. Find out how to maintain and grow a lawn, the right way. For hands-on landscaping ideas and lawn care help, check out our Easy Lawn Care guide. Written specifically for the home gardener, our Easy Lawn Care program shows you the fastest and easiest way to either restore your existing lawn, or install a new one. For instance, planting the right grass seed for your lawn can be a confusing task given the large selection of brands and turf grass types available. Grass seeds or sods? We've made it easy! pests and problems that commonly affect lawns, vegetables, trees and garden flowers. 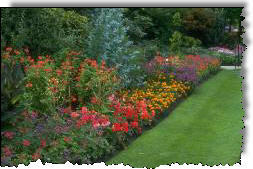 101 Gardening Tips: A - Z of Pests, Diseases & Disorders Completely FREE from your friends at Lawn-and-Gardening-Tips.com!